Why isn't anyone doing anything about the bloodshed in Syria? Another deadly day of bloodshed... as the world stands idly by and watches Syria's government murdering its own people. Opposition groups say more than 50 people were killed today. Hundreds more were reportedly killed in the city of Homs over the weekend. And the killing has become butchery. One Syrian told the New York Times of seeing the beheaded bodies of women and children lying on the roads. And the civilized world looks on and does nothing. China and Russia vetoed a U.N. Security Council draft resolution that would have demanded President Bashar Al-Assad stop the violence. China and Russia say it was a potential violation of Syria's sovereignty. The U.S. - along with other Western and Arab nations - are pushing back, calling for the international community to do more. The U.S. says it was "disgusted" by the veto. Secretary of State Hillary Clinton said that blocking the U.N. resolution is to "bear responsibility for the horrors" happening in Syria. President Obama has condemned Syria's "unspeakable assault" against its people. France calls the recent massacre in the city of Homs a "crime against humanity." The British say the veto will only encourage more killing, while Germany says "the scandal would be failure to act." Lots of words, no actions and the killing continues. The U.N. says at least 5,000 people have died since the conflict started. Here's my question to you: Why isn't anyone doing anything about the bloodshed in Syria? The rest of the world is cowardly waiting for the US to do something about it! It is time European nations step up to the plate! For one thing the U.S. can not afford another war or should I say a police action. That is how we go to war without congrestional approval. We just can not be everywhere the unjust are in power. I am sure the US is doing a lot that is not visible to the public. That said, The Assad regime still has tacit support from the Arab League, and the region is so unstable that, without a plan that identifies the end-game for Syrian Leadership, the US has no real ability to advocate for a solution outside the UN Secuirty Council which has refused to support a resolution that has teeth in it, and there is no way we do anything militarily without overt Arab support, which we do not have. The situation has to play-out the way the Arab community will advocate. 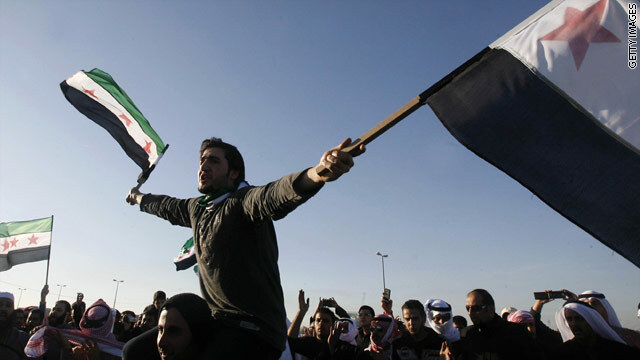 Why cannot the surrounding Arab nations free Syria? They have the means and forces. I think Obama should leave Syria alone and let them take care of themselves, why help a country that hates the United States and would never support us in any way. were we not experienced with Iraq war and its drain on our economy? Did we get Oil? Now Iran, republicans are talking about Bomb Iran. Tell you the truth, I don't think there is enough Oil in entire Middle-Eastern-Block Nations. Now is the time to have Oil-Independence, and Green-Energy Push. Don't you think, Jack. So, Obama is right, let world deal to this nonsense, not USA. No new wars, read my lips. Obama2012. See Lybia. Thats the short answer. The longer answer is that we don't know what the end result would be if we did kill Assad. Then what? Do we have to take out all his family members, and the top members of his Regime? Would Russia be so offended it would start another cold war. What about the Chinese reaction? Who would end up in control of Syria if we could install a Democracy there? Besides, Obama has his own problems brewing at home. Oakland, LA, San Francisco, San Jose, and Portland. Seattle, Phoenix, Minneapolis, Chicago and Washington DC. New York City, Pittsburg, Buffalo, and Miami. The bell is ringing loudly, it is ringing here. Doug, Pepperell, MA. Because Syria didn't have nice things to say about Israel. Jack, I consider myself to be an average American and I feel it is time for us to stay out of other countries civil wars. We are tired of being in a war. We are tired of seeing our servicemen and women coming home wounded and in body bags. Quite frankly I had enough and feel that Syria needs to settle its own problems. We had a civil war with over 1 million killed, at that time there were no cries from other countries to stop the bloodshed. I know that sounds cold but every time we get involved all we have to show for it is more grave markers and more wounded vets. After the conflict is over or even before we are always asked to leave. Could it be that the US is learning the high cost of butting in? The US and half of Europe is broke. Since WWII, the US has butted into the business of everyone and the world hates the US for it. Syria is a United Nations problem and therein is the problem. The U.N. is a totally ineffective body that exists to only pad the pockets of those delegates that encompass the group and spread anti-American propaganda.I cannot think of anything the U.N. has done to calm the Middle East or anywhere else in the world. Why isn't anyone doing anything about the bloodshed in Syria ? Russia & China didn't agree or "sign on" with the rest of the other nations, Jack. Why ? It's a good question. The way I see it, the reason they didn't want to agree with taking the Dictator out, is because "someone" (or another country) will have to be their "police" – get it ? Think about it for a minute, the U.S. is hoping that the assad regime will finally get their country under control, I guess. The U.S. most likey doesn't want to get involved, unless we get every, and I mean Every Nation on Board. Why ? Look at what happened in Iraq – we took saddam out, & now they can't even "police" themselves, isn't that pitiful ? Take a look at Libya, we took out Gaddafi – & Now, Somebody Has To Police them too. I mean, how many countries do we have to "police" ? Those 3rd world countries where the women has to wear all that 'garb' from head to toe, and have so many different religious factions, including Islam, where all they care about, or all they know is : bomb / bomb / bomb people / buildings / and end up blowing theirselves up, including taking some people with them, Then it's not really worth getting involved in, would you think ? So – all that being said : I can't hardly blame Putin or China to NOT get involved. Bottom line is, Those 3rd world countries is where the women would get stoned to death, IF they showed their ankles, are Not Ready to Change to Western Way of Life, Jack. They are about 75 to 100 years Behind us, Jack. It's like trying to Change the Caveman to the computer age. In those countries, "Change" has to come slowly, and it's Not necessarily taking out a Dictator. The world has so many problems and few solutions. War solves nothing, replaceing leaders does not mean change and certainly no guarantee of a better situation. Even in America wher we change President either every 4 or 8 years nothing really changes. If you're talking about America not doing anything Jack, I suspect it's because there is a very growing attitude in this country that playing the world's "policeman" is a really dumb idea. At some point America needs to stand back and just let the chips fall where they may. We are bankrupting ourselves with involvement in other nations affairs. Let the Syrians and those of other countries desiring change work it out for themselves. There's no oil in Syria. After being burned in Iraq and Afghanistan, and the criticism Obama is getting from some on both sides for doing too much or too little in Libya, and loooking at what;s happening in Egypt, a president would be crazy to take on Syria in an election year. Whatever he does will be spun wrong by his political opponents. Doing nothing is the dangerous course for him politically. In fact doing nothing in the entire Middle East and leaving those peopl alone to work out their own problems is probably best for everyone worldwide. Maybe one can look at that Hussein's Iraq, where there was no threat to us or others. We killed thousands of innocent Iraqis ,and lost over 3000 of our own invaders, plus over 30,000 wounded in an undeclared war. We just left them in a ongoing civil war between the same groups Hussein held in check. The point is, are we interested in human resources, or natural resources when it comes doing something about Syria, or any other country in the Middle East for that matter. Jack: They are doing about as much as they can do without making Russia and China mad. Covertly, we are giving weapons to young rebels who will fight the regime. Politics plays a big role, because we are about to have a national elections. We are more interested in Iran, and we do not really care what Russia and China thinks about our policies in Iran. Israel is very interested in Iran, because they are making weapons grade Uranium. Syria is not that important to anyone outside of Syria. How about taking care of the bloodshed at home first? If we are going to focus on stopping the, "alleged" bloodshed in Syria, it must be done from the prospective of forwarding American interests. No American interests are served by murdering innocent women and children in defence of Apartheid Israel. Apartheid Israel has cost America Trillions of dollars and destroyed Millions of American lives. We must stop all support for this terrorist sponser. The Israeli's send Johnathan Pollard to spy on us, murder US sailors on the USS Liberty and then jeopordize American lives on a daily basis through their continued occupation of Palestine, and we are supposed to invade other countries and morph our foreign policy decisions to represent their interests? I dont think so. Americans are not going to take it anymore. The current status quo where the media is controlled by Zionist interests is passing. Americans are waking up to reality – Ron Paul is going to become the new face of a better, brighter America. America has lost it's will to fight. The CIA can send in covert operatives and provide the rebels with arms but Obama is afraid of the Russians and the Chinese. You can see where the moral values are with the Russians and Chinese as far as human rights go. By the World War 2 standards the people would call us today "yellow belly cowards". Because No one really knows who the aggressors or instigators truly are. Syria was doing just fine until America attacked Iraq. The over population caused by the influx of Iraqi's who fled when the United States attacked Iraq is the real culprit. America is the one responsible for it by attacking Iraq and forcing the citizens to flee to Syria. Syria can not afford to provide for so many people crammed into such a small area. No one knows what to do and there is no simple way to solve it other then to send people back to Iraq. The mistake of the U.S. attacking Iraq is taking it's toll on many nations and they are the ones feeling the fallout from it while America pulls it's troops out and heads home. I assume by your question that you mean "Why aren't WE doing something about Syria". My hope is that WE aren't doing something about the violence in Syria because It IS NONE OF OUR BUSINESS. If the American people don't drop their love for intervention and withdraw our long proboscus from everyone else's business, we are forever doomed to aggression (no matter what we call it). and we will continue to aggravate, alienate, and downright offend the entire rest of the world. Listen to Dr. Ron Paul on this issue. He is 100% right on this issue. We must shift our innate love for soap operas and other people's business and see to our own domestic issues and defense.. or we will eventually destroy the world.. if the world doesn't find a way to destroy the Ugly American first. I must add: the national media leads the way in rabble rousing America into unwise action. The answer is that we the people must learn to IGNORE the sensational media hype, in both politics and foreign policy or we shall continue to be drawn into passion for all the wrong causes that rightly should concernn us. I suspect it's because of Iran, I have to admit that I haven't followed this story as much as I have other ARab countries. Obviously China and Russia didn't support the UN action becasue they sit much closer to the Iranian border. Because those champions of human rights, China and Russia, say no. This is unbelievable. Makes you wonder what happens here in the US when the civil unrest (read hatred) the rightwing extremists have been trying to ignite catches, if it does. Will the rest of the world just sit by and watch us implode? Interesting, no? Last I checked, the Arab League consisted of 22 member countries, including Syria. It's about time for them to take responsibility for moderating the behavior of their members, both in Syria and in Iran as well as end the absurdity of their unifying hatred of Israel, which ironically is the aspirational democracy of the Arab spring. And just who's job do you think it is? Or does it look all to easy and clean to handle it with drones and air strikes? And who is then next? North Korea? Cuba? Until all the people of the world are able to raise their individual level of consciousness, so we do not place a value on people's lives in regards as to how they affect our own lives, but rather protect, empathize, and show compassion based on just being human, either overseas or in our own country we will never rise to the basic human needs of all mankind totally and purposefully. And what would you have "Anyone" do Jack? Two reasons, Jack. First off, China calls the shots now, not us, and they like the idea of having a dictator in their pocket that they can control. Secondly, the world is growing weary of the typical scenario where there is an uprising, the dictator falls, religious and tribal factions carve up the country, and it all ends up on someone elses doorstep to resolve, only to be repeated a few years down the road. The Middle East will never, ever change. The U N Security Council is definitely trying but China and Russia care more about the potential adverse impact on their economies than doing what is right for the good people of Syria. They don't have any oil (unlike Libya), are not developing nuclear weapons (unlike Iran), and Israel can kick their butts militarily in a couple of days (like the rest of them). I think the biggest reason is we are too broke to be of assistance, and too afraid of what the resulting Mad Hatters will form as a government. According to the office of the United Nations High Commissioner for Refugees (UNHCR) there are 1.7 million Iraqis living as internally displaced refugees, while more than 2 million others have fled across the border to Syria. This is why the country is in such unrest and is a direct result of Americas attack on Iraq. No one wants to get involved militarily because no one knows who the good guys are and who the bad guys are so who do you go after? A military assault in this Area would drive refugees to Turkey and Iran which would cause even more unrest. There is no military solution and you can not put the genie back in the bottle after Iraq. Democracy was born like it or not. There won't be any major concern about the bloodshed in Syria until the turmoil affects oil corporation profits. That's when it will become a noble cause for human rights – and oil profits. Obama will sit on his heals until the Muslim brotherhood gets a good foothold there then he will respond. If Obama wasn’t so weak on foreign policy these fires wouldn’t be breaking out all over the globe! I want to see women, gays, and illegals subject to a mandatory military draft and sent straight to the front lines with no protection from the real men that have been the bed rock of our countries defense; then you would see the liberals doing a better job of handling foreign affairs! I dunno, Jack. In this election year, could it possibly be that the warmongers in this country have decided to let this one slide, considering that it's none of our business and we're just ending two other idiotic, blood-sucking, drain-our-wallets wars? It's like that old 60s song - "When will they ever learn?" Who is "supposed to" depose the Syrian government to stop the bloodshed? The UN? Russia and China have blocked every attempt to reign in any authoritarian regime anywhere in the world, including Syria and Iran. The US? No, we are NOT the policeman to the world. It's not our job, and we can't afford it. Have you forgotten about our massive budget deficit? The Arab League? Well, they have a greater responsibility than anyone for dealing with this problem. It's in their backyards, and they have some very wealthy countries with well-equipped militaries who could easily handle this problem. But so far they haven't done anything but send some observers to Syria. Syria engaged in some massacres right in front of the observers, and the Arab League continued to do nothing. So I suggest you start pressuring the Arab League get off their butts and invade Syria. Two words... politics and power. The Obama administration is limited to use of formal diplomatic channels, lest his GOP opponents decry his abuse of power if he orders either direct or indirect use of our military assets. The unstated caveat is that he will be accused by his opponents of doing nothing to save Serian lives as the election nears as well as the Extreme Right claiming that the President is leading from behind by trying to build a concensus in the UN Security Council, whom they already state we need to get out of. Hindsight is 20/20 and armchair QB opinions are like armpits...everyone has them, but they usually smell bad. USA, not interested in WAR, and Drain on Economy...period. Why isn't anyone doing anything about the bloodshed in Syria? Because no one cares and the Syrians do not care about anybody but themselves. Let the country implode. Syria does not sell oil to our NATO partners, unlike Libya, so no one can trace European petro-dollars to oppression by the regime. I suspect that once the Syrian revolution succeeds, it will be harder for any tyrant to assert control, so letting the road to freedom be hard may not be such a bad thing. The need to fight the military for power in Egypt will also mean that, in the end, any resulting democracy is stronger. I don't know why, but please don't let it be us! I am sorry that these civilians are being murdered in the street and comend them for standing up for their rights against the threat of death, but we cannot help them, at least not militarily. We are broke and we need to help ourselves and our neighbors who can't find jobs, losing their homes etc. Whether anyone admits it or not, even to themselves, we are all dead tired of the Bush-league wars that have gone on far too long. One of them is still going on. We want to and need to focus on our own multitude of other serious problems exacerbated by the economic drain of these two wars. And that includes the ongoing financial obligations to Blackwater (by any other name) and the six figure salaries of the thousands of mercenaries still in Iraq. Finally, we may be coming to the realization that we can no longer police the world; our resources are exhausted. For the same reason no one did anything about our civil war. It is not the business of the u.s. to police the world. Is egypt, iraq, libya, or afghanistan any better off now that the u.s. got involved? Until all the people of the world are able to raise their individual level of consciousness, so we do not place a value on people's lives in regards as to how they affect our own lives, but rather protect, empathize, and show compassion based on just being human, therefore, either overseas or in our own country we will never be able to rise and provide one another the basic human needs required of all mankind totally and purposefully. Shame on all of us for putting a price on being human. unfortunately there seem to be an almost throwback to "The Cold War" "what ever it is, I'm against it" attitude from the Chinese and Russians in the United Nations about anything propsed by the Europeans or Americans. also the Arab League, the Turks and the Israelis are afraid that IF Syrian leader Bashar al-Assad was overthrown, they would have chaos on their borders SO they "talk tough" but DO nothing. China and Russia will be dealing with the same problem – "OVER POPULATION"
only one resolve – let'm kill each other off – coming soon to a nation near you! What can anyone do. Saddam was in charge of Iraq for almost 25 years, and during that time over 400,000 people were tortured and murdered for no other offense than they did not agree with him. International peace groups like Human Rights Watch and Amnesty International issued reports on the abuses. Period. The international community heard them and still dd not respond. But when Bush One went into Kuwait and Iraq in 1991, the international peace groups and leaders of some European countries wanted to try him as a war criminal. Much like the Dems and the same European leaders wanted to try Bush Two after 2003 invasion. The point to remember is that a strong dictator will survive and it is only the leaders citizens that will suffer. Sanctions and embargos will not be enough in the case of Iran and Syria much as was the case in Iraq. Its a real good question. Seems as though the standards for human rights varies from country to country. Before the US gets involved in any way....its up to the Arab League and surrounding countries to form a coalition of defiance against the brutality. As to why they don't, I have no idea. Haven't you heard the Republicans, it's because America is broke. It's disgusting. Russia and China are standing by silently because of their own selfish interests. The UN needs to send troops in and I personally believe that the US should bomb the capital until Assad is dead. How many more Syrian people have to die before the world takes action? Truly a Disgrace. You need to learn to read between the lines a little better if you are going to preface this question as to why “no one is doing anything” about all of this. A mini-cold war is being played out in Syria right now and the conclusion of this mini-cold war could have major ramifications for the whole region and even the globe. Not unlike the Iran-nuclear issue, the whole world is taking sides, based on their national interest, as to what they want the outcome to be. For the West, the end of the Assad regime and the ascension of a Sunni government weakens Iran’s clout in the Middle East. For Russia, China, and Iran, keeping the status quo in place means more clout in the Middle East for Iran, China, and Russia, but it is also a statement of principles for Russia and China since they are always worried about internal conflict and the possibility of foreign intervention. The Syrian people are pawns in a Geo-strategic game which could determine the power balance in the Middle East for the next decade. Every move has a counter move, and every counter move could destabilize the world and lead to war. That’s why no one is taking any overt action right now. The same thing could and should be said about China with it's treatment of it's workers or Russia and it's way of treating people and then there's North Korea. The word fear comes to mind with these countries due to a nuclear threat and then there is how do we pay for any more involvment. No one wants to make the initial move to help the people who need help like Syria as this is a UN issue not an American issue. No oil, no drugs and they don't vote Republican. Good Question, Jack. My Opinion ? This is what it was like – here in good 'ol America, WAY Back, I'm talking 100 + years ago. Remember the cowboys & Indians days ? I mean, watching the westerns on t.v. ? I honestly believe that's the way it was Way Back then. When the cowboys came, they fought the Indians for years, took their squaw's – and inflicted all sorts of pain towards the Indians, such as burn their tee-pees down, and everything else you can think of, Jack. Then, after several years of fighting, some of them wanted to start being friends,So they then they traded furs / axes / knives / & etc – The cowboys also traded, such as horses / wagon wheel buggys / food / pots / pans / & etc. So, they finally became friends eventually. Then, after more time goes by, the Indians ended up on reservations. Then, the cowboys started building houses, camps / trading posts & etc. Maybe this is Their Civil War, Jack, hell I don't know. Moral of the story Jack, is that, it takes Time, to come from killing people – to getting along with one another, and respecting one another. THEN – it's all about building houses / roads / bridges / building factories / and all of a sudden you're Working for a Living, Raising a Family, Putting your Kids through School, Buying a New Car & etc. and Enjoying Life. This may be something that they will have to go through, Jack. They might be a better country after they go through this turmoil, or "phase" – like the United States did, back during the civil war, or when the cowboys and Indians were here. The United States borrows money to fight wars on foreigh soils. It just so happens our lender is China who opposes overthrowing the Syrian government. Sounds like the people of Syria chose the wrong time in history to rise up against its government. We are walking a tight rope without a net and the rope is greasy. The people of Syria may have to go it alone. China and Russia didn't 'sign on' because they want the U.S. to go into yet another war and have thousands more of their forces killed. The U.S. is slowly, but surely depleting their armed forces and another war could put it perill of being overtaken. I hope the U.S. stays out of this mess ... because it really is none of 'our' (North America's) business. Jack, four words: No oil in Syria. 1) There's no oil in Syria, 2) There's no oil in Syria, and 3) There's no oil in Syria. Russia abstained from the UN vote against Libya and the end result was a nationwide massacre sponsored by the US who launched 250 cruise missiles into Libya and demanded the overthrow of Gadahfi. Our actions against Egypt were similar and our peace keeping missions are causing more bloodshed than we are preventing. This is why Russia & China "vetoed" the UN Resolution, and more lives will be saved if the Western Dictators [U.S., England, & France] stay out of Syria. All I can say is Assad has killed over 5,000 of his own people in Syria in the last couple of months. I, for one, am pretty glad that Israel destroyed Syria's nuclear program in 2006. Jack; are you asking why? simple; there is no oil there... Syria is no Iraq Jack. Jack, you ask why no country is getting involved with Syria? No country has the funds to get involved. We are all broke! No country wants to be the first to get involved and look like the Peacekeeper, like America is classified as. Most countries just want to stay out of the way. Not getting involved IS doing something. An uprising in Syria does not threaten our national security interest. Translation: They aint got no oil! Is it really that hard to figure out, Jack? It's the Cold War again. Russia sailed their fleet to Syria as a show and I think it was very effective. Russia is clearly taking a "hands-off or else" stance. Nobody wants to go to war over Syria's long-standing problems. Face the facts: Russia is still a iron-fisted dictatorship and that will not change soon. russia made be weaker than in the past, but, they are still a formidable threat. Everyone knows that overthrowing the exisiting regime means losing Syria and it's resources and the Russians are willing to fight for that. The answer is obvious to me no special interests. We rushed into Lybia because they were going to change from trading oil in American dollars into their planned Gold standard. It would have taken down the world economy. Syria no economy no interest. Sad world Jack. Jack, It' very simple, NO OIL !!!! Isn't it obvious.........how much oil does Syria have? It all comes down to MONEY! How do you know "nothing" is being done? 1. Many of the Syrians are cautious of the outside world and don't want to get aid from someone they think will leave them flapping in the wind at some point. 2. Most importantly, Syria has a huge stockpile of ballistic missiles and chem/bio WMD and a failure of the Syrian state would see bad stuff go everywhere. 3. There are covert programs to aid the rebels. Because no one wants to work together (cough* China and Russia cough*) to stop a regime that is freely and openly killing thousands! Frankly it is pathetic and stupid, a Syria does not deserve sovereignty if it kills its own people like that. Syria is Russia's representative of interests in the Mid-east, of course they are going to veto it. China is just there to not let Russia feel left out. On the issue of Syria, I blame those you-know-who who treat civilians as disposable tools in their efforts to realize their strategical goals. As the old saying goes, an uprising from within is the cheapest type of external warfare. Why us the USA pushing to go into Syria? Look at the mess that is going on in Egypt and Lybia since the world internviened and got rid of those leaders. It is time for the USA to stop pushing to get rid of world leaders. The USA does not stay long enough to stablize the countries. Look at how Iraq is now compared to what it was before you attacked. They are in a civil war. The USA would not want the world to meddle with your protestors and government. Why meddle in other countries? Do you need US Troops in Syria before you attack Iran? Stay out of this! The Arabs don't want anything from us but our money and FREE military aid. Stay out of Iran too, let the Jews handle it. That's easy Jack. There's no oil in Syria, or we would have intervened immediately. The international community stands bewildered as they cannot fathom the butchering of people over being your daddy's son's dictator of a beautiful country with people oppressed and desiring to be free. Remember Hotel Rwanda's Genocide, Armenian Genocide, and here comes Homs-Syria Genocide. It will tak an international humanitarian force, corridor to save the women,children as hundres more will die, probablymore–and we know how ineffective the UN will be until smeone thinks–Bosnia Two? And remember–China rules Tibet, Russia rules dissident provinces with an iron hand–don't expect much but shipping arms to Syria from these leaders-they have too much at stake to be humane. I think nobody wants to interviene in Syria because of the fear of engaging in a war that may turn in an endless solution like Iraq and Afghanistan's. Unfortunately, due to this hesitation, Syrians are having their lives slaughtered by a dictator who has been benefited by full impunity. Syrians are completely vulnerable and their faith seems sealed while nobody shows any compassion toward the them. How sad! Is it any improvement in Egypt or Libya? Are liberals getting power there? The U.S. should stay out of this affair, despite the horrific details coming out of Syria. I sincerely feel for the people of Syria, but there comes a time when America needs to take off the "global police" badge and start considering a non-interventionist foreign policy, especially in a time of economic turmoil here at home. All of you know nothing about Syria. The Islamic terrorists are doing the killing in Syria. They are armed by Qatar and Saudii Arabia. Since the US is an ally of Qatar and Saudi Arabia, we let the killings go on by blaming the Syrian government. It's sad that the US is doing this. It is about oil. Oil we get from Saudi Arabia. FACT. After reading some of the comments, it is apparent to me why nothing is being done. Who does something first and our god money has become more important than children being beheaded. Karma Jack.. it will come back to get those nations who are standing on the side lines screaming you go first. The answer is simple ... it's GREED! Good ole fashion GREED! Protect ones financial interests and let blood shed be damned! People will replace themselves! Should one lose a few lousy dollars dollars .. well hell ... that comes from ones pocket! Better a few more lives lost than ones money! It's not unlike giving corporations tax breaks while arguing about a the dollars being spent on the poor for food stamps! What exactly do u want the USA to do???????? US keeps paying off these countries and won't take care of their own people. What is wrong with these officials? I swear I think they lay in bed at night and just think up something else stupid to do. I'll tell u what to do!!! Just bomb them all off the map and get it OVER with!!!!!!!!! !But just like Revelation says, It's almost finished. Then we won't have to worry about anything anymore. We'll either be in heaven or HELL!!! Politics!!! Jack , right now is is all about politics., have not heard one word from either party about a course of action for Syria .. If Obama does something it could backfire and lose an election, it the GOP suggests something , and Obama did it , they would rescend the suggestion and if it worked they would spin it every which way to sunday about all the millions this president was borrowing for another war. No one can survive the politics of it all. But can we sit and watch women and children beiong slaudered, what kind of world are we? Personally , I want no war but killing the Syrian prez (killer of babies) would be okay just send in seal team 6! Deed Done! The world economy is weak and without the UN collaboration it will be economically devastating for any sole military movement. Everyone is too worried about the political implications of interfering in Syria. It's too much of a risk for most political leaders to get involved. Meanwhile, thousands of Syrians are being tortured and slaughtered. Furthermore, UN resolutions (if they ever pass) aren't going to do much until someone actually steps in to stop the massacring of the Syrian people and end the rule of the brutal Assad regime. And even if a UN resolution would make a difference, Russia is too concerned about its own interests in Syria and in the region to let any resolution pass. Political leaders need to just stop for a second and actually think about what is happening to the people there and come up with a real solution to end all of the bloodshed and massacre. It's ridiculous that we have let this horrible conflict drag on for so long. A Monkey know's exactly whats limbs he can jump on. I cant tell you why no one is stopping the Assad regime's reign of terror. Some of the most horrible things ever are occuring in syria yet the world watches and does nothing. America should stand up for the Syrian people, crush the Assad regime and ensure that no more young children get murdered before they've been given a chance to live. Despite the recent approval ratings, we have an administration that believes in strong words, but is cowardly when it comes to foreign policy. Yes, the economy may be recovering, but if we don't have a strong leader to get China and Russia to join us to stop the violence in Syria, we will have lost all credibility in the world as a world power. A good administration can handle both domestic and foreign policy, but what we have is weak. We should lead the way, go in there in full force and restore order. People there are waiting for help and it should be us. I trust Obama to choose with advisers, too do the best thing. War mongers are not from the God I know. Or to kill thousands of Innocent persons to go after 50 terrorists or evil government leaders. Then borrow the money from China and call the cost the next presidents debt. Maybe we can say after Iraq, our government is using more common sense. "Blessed are the peacemakers...". Syria doesn't have any oil! U.S. is not the world's police. Jack, you sound like you think we, the U.S., should do something about this. It's terrible but the thing is we cannot get involved in another war. We're having a very difficult time saving our economy and country because we got involved in the Iraq war and spent billions of dollars and ran up our deficit. We cannot save the world. Let someone else do it this time. I'm sure the Republicans would like to criticize Obama which ever way he decides to go on the situation – if he helps them he's bad, if he doesn't help them he's bad. No one is doing much for the same reason the USA brandished its veto and stood by when the Israeli's bombarded Gaza and Lebanon and becuse the last time they went along with a UN no fly zone resolution the West turned it into blanket permission to bombard the country. The US showed its contempt for the Un in Iraq and when it threatened to vetothe Palestinians seeking statehood from the security council. Somehow the US is appalled by people killing their own but finds killing others highly acceptable. The United States should show the world what we stand tor and work with the majority and forget about the freaks (Russia and China)! You people sat back and watched Saddam gas and murder his own people because you were using him as your pawn against Iran. How many other countries are people being murdered in and the USA is sitting back? What is the real reason you are promoting the violence in Syria? The USA has not come to the rescue of any other African country over the years. What is the USA interent in the North African countries? Are they going to be staging areas to attack Iran? Four words – No oil at stake. No oil and no spoils of war. The reason is because America isn't willing to send anymore men and women to fight and die on foreign shores. After a century of policing the world the US is no longer willing to continue this trend and surprise, surprise no one else is willing to take up the task either. The Islamic terrorists funded by Qatar are doing the killing in Homs. That is a FACT. There is a propaganda war going on. CNN is playing their part in it. Good job, Jack and Wolf. Christiians and other minorities are being killed by the Islamic terrorists in Homs and elsewhere. Why is Assad still in power? Because the Syrian People support him. Because we have used up our military power wastefully in Iraq and the American people are tired of war. This should have been a place where we could make a difference. Russia is looking the other way just in case they have to deal with their own unrest in the same manner and the Chinese are just doing what they always do, it's not their issue. Why isn't anyone doing anything about the bloodshed in Syria? Why do we have huge churches all over the world adorned with gold while people starve and are homeless? Why do political leaders and CEO's get paid hundreds of thousands while wages are so low for the rest of us we cannot pay our bills on one income anymore? Because few people stand up for what they believe in enough to actually do something about it. The current batch of Humans on this planet are lacking in their humanity. Well hello.... Syria has oil! War is very unpopular, and with elections right around the corner for Obama there is no way he is going to ruin his chances at another term with starting a war. Not to mention how far the U.S. is in debt already. I agree that something needs to be done but Obama isn't going to do it so count the U.S. out! Please, come on Jack.. The reality is that Syria has no natural resources for US corporations to make any money from. Therefore it's not in the US's interest to spend billions of dollars, armament, and military. After Afghanistan (natural gas and precious minerals), Irag(Oil) and Libya(Oil), we have to be careful not to spend anymore money or waste anymore life until it's time to fight Israel's war with Iran. Liberating Syria would be purely for noble reasons I'm afraid the US gov't. coupled with corporate lobbyists no longer pass laws for the sake of humanity, not for the people of the United States and surely not for others. The world is not waiting for the USA to do something. The rest of the world believes that internal conflicts within a country should be left an internal matter. Only the USA thinks they have to meddle with what goes on within a country. The USA did not meddle when they knew of the genocide going on when Saddam gassed his own people. The USA turned a blind eye when mass murders were going on in other African countries. Why doesn't the USA help Mexico with their drug lord problems and the murders there? Clean up your own country before you start meddling with the internal affairs of another country. Ask yourself... why is Assad still in power? Simple answer..... the Syrian People and the Syrian Army support Assad. What you see in Homs is death and destruction brought about by the Islamic terrorists who are armed and paid for by Qatar. How about that Arab Spring in Egypt? Are you ready for Salafi democracy? Jack, the US is, and I, are very concerned for the people of Syria; but are we to police the entire world and continue to look outward as the US government takes action to suppress it's own citizens? The Feds passed a law authorizing/requiring the military to indefinitely detain, hold incommunicado, and hold without charges anyone (including US citizens) SUSPECTED of being a terrorist. None of the major networks made more than passing mention of this act. We are guaranteed by the Constitution the right to be charged and be judged by a jury of our peers. Where is the public outrage over a congressional act that potentially strips Americans of the right to disagree? The world voted NOT to go into Iraq but the USA went in anyway. The world see syria as an internal conflict. Syria is not attacking another country. So let them fight thier own battles within their country. The USA meddles to get rid of a world leader. Then they leave the country in a huge civil war. Because: Syria is not rich in oil , who is going to cover the cost of the any operation, Israel did not give the green light ? although we should know there is no more danger from new democratic government in Syria, we are confused what is going to happen after Assad oust, but I think we should be all pass the worry about Islamist taking over, I am more hopeful to get civilian elected regime when Assad is gone. the most important question, at the end of the day, more innocent people are dying every day under the watch of the whole world. coming from the liberal side, I believe in post Assad Democratic peaceful Syrian . Ask the Russians and Chinese. Just Syria?? How's that Bloodshed in Libya going? French diplomat tortured to DEATH last week. How's that Bloodshed in Egypt going?? U.S. Citizens imprisoned and detained, who knows what will happen to them? Wonder how Obama will talk his way out of our involvement in both??? Looking bad all over the Arab Spring. Hate to say, "I told ya so", but "I told ya so"!!! We are waiting to see what the situation is with Iran! The US at one time supported Saddam Hussein, Bin Laden, Mubarak, Saleh, and Kaddafi. They are all gone. All supported by the US. Assad is not supported by the US. What does that say about US support. Basically, if you want to keep your job, stay away from US endorsement. The rest of the world is waiting for the US to step in, as we've become famous (infamous) for doing over the course of the last decade or two. The US doesn't care much about Syria because they have no oil, or other commodity for us to leverage as payment for helping their plight. Russia is sitting on huge oil reserves that can bring them riches, yet they can't bring it to market unless the price is high enough to make it worth creating the infrastructure. Russia is set on driving the price up by creating danger to the rest of the oil owned in the world... they sell weapons of war to them, nuclear reactors, and would be happy if the mid-east went up in flames leaving them holding the majority of the worlds oil. Russia is the mob, they bomb the store front like a mob, and the current competition is the mid-east, so they will do anything to see unrest take hold... there is a reason the whole area is aflame, and it's not in the name of democracy. Because the US is out of money to fund another war. How many times is it reported that we are out of money. We cannot take the lead. Another war/civil war/uprising/unrest in the Middle East? Quelle surprise! Shocking, simply shocking! And whose job is it to police the Middle East, whose job is it to be parents to squabbling children? The last thing the US needs is to get involved in another Middle East country's internal problems. Self-determination means they get to sort out their own problems. If we did, it would be lose-lose for us; the Syrians would turn on us and be united in their hate of us, and we have enough of our own problems to worry about without taking on Syria's problems.